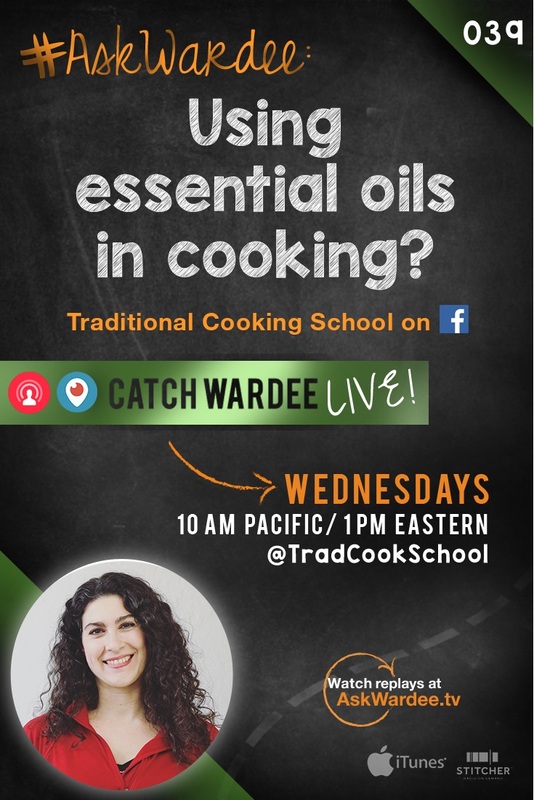 “What do I need to know about safely and effectively subbing and using essential oils in cooking?” asks JulieAnn K. on today's #AskWardee. I'm sharing my thoughts below! Is It Safe To Use Essential Oils In Cooking? First of all, keep in mind that common cooking ingredients can be harmful in high doses — like salt. With essential oils, some harmful components are evaporated off during distillation, and in others the compounds are so minute that, used in moderation, you’re generally safe. So, yes, I believe it’s safe. But this is controversial and some people say absolutely not. I’m not going to say yes for everyone. Certainly with young children or babies or pregnant mamas, you should do your own research and err on the side of caution. By the way, we're talking about high-quality, therapeutic grade essential oils like those from my preferred source, Rocky Mountain Oils or Aroma Foundry. Before I get to them, please know that you're invited to join me for a lot more information on cooking with essential oils at the Essential Oils Revolution 2 online conference. Just go here for more info. There are 2 ways to use essential oils in cooking. This probably is not exhaustive. Add your favorite ways to use essential oils in cooking in the comments! The essential oils that are essentially the same as the herbs and spices in your cupboard can be used as herbs in your cooking. Think clove, sage, marjoram, basil, etc. The names are the same, so that's a big clue! Add them to your dishes at the end after the food has cooled, so that you preserve the aroma and nutrition. 1 drop is like 1 teaspoon of dried herbs. Or, in the case of bold herbs, such as thyme, basil, oregano, rosemary and marjoram, only a tiny bit is necessary. Dip a toothpick into the bottle and then dip the toothpick into the food. Stir, taste, adjust. If you'd like a checklist of the oils that are generally regarded as safe for cooking, register for the Essential Oil Revolution 2 online conference and I'll be giving it out for free during my talk. Lemon, lime, or orange extracts can be replaced by essential oils. And they're yummy! Replace each teaspoon of extract with 1 to 2 drops of essential oils all the way up to 1/4 teaspoon (25 drops) of essential oil. Start with less and increase until you get the desired flavor. Remember that flavors can intensify so it's best to use less rather than more! Think of the possibilities… cheesecake, muffins, ice cream, popsicles… mmmmmm! 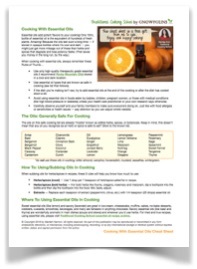 Want More Info On Using Essential Oils In Cooking? Check out the Essential Oil Revolution 2 online conference. You'll get access to dozens of talks on essential oils, including my own “Practical Tips For Cooking With Essential Oils”. You'll also get access to my free checklist of oils that are generally regarded as safe for cooking, including suggestions for usage. It's a free gift for those who watch my talk. Get info on the essential oils conference here — and be sure to watch at least my talk! What can you share about using essential oils in cooking? Disclaimer: At Traditional Cooking School, we recommend using only pure, therapeutic grade essential oils such as those from Rocky Mountain Oils and Aroma Foundry and those generally recognized as safe (GRAS) by the Food and Drug Administration. The information provided by this website is intended for educational and informational purposes only. This post or the essential oils mentioned therein are not intended to diagnose, treat, cure, or prevent any disease. Please consult a qualified aromatherapist when using essential oils for any purpose. If you are pregnant, nursing, taking medication, or have a medical condition, consult your physician before using these products.